Name an application and it seems Western Digital has a colored storage device optimized for it. Today, the company unveiled its WD Purple drives: A class of hard drives that WD says is optimized for mainstream video-surveillance applications. 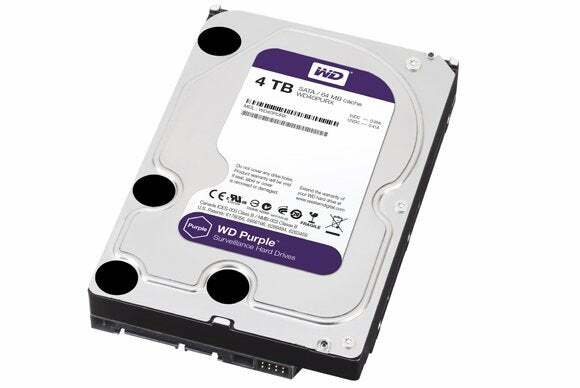 WD says its Purple drives are up to 45 more power efficient than its competition. WD is aiming the Purple drive at OEMs building mainstream video-surveillance systems and NAS boxes designed for pairing with IP video cameras, as well as home, small office/home office (SOHO), and small- to medium-sized businesses (SMB) looking to upgrade existing systems. The drives are designed to be installed in table-top surveillance systems with 1 to 8 drive bays that support 1 to 32 IP surveillance cameras. The drives are rated for workloads of 60TB of writes per year and are backed by a three-year warranty. 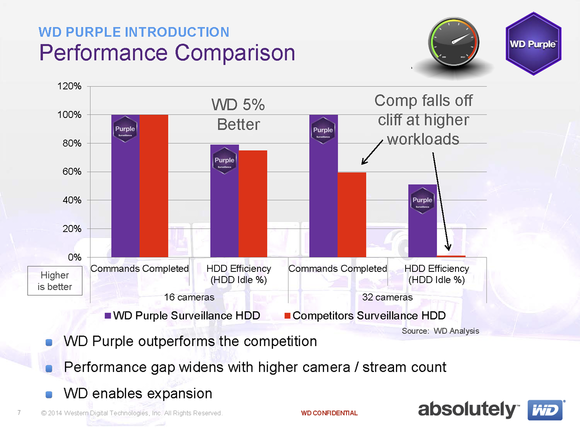 WD claims its Purple series drives outperform the competition by a wide margin with systems supporting up to 32 cameras. Reid touted WD’s new AllFrame technology—a caching algorithm in the drive’s firmware—as the Purple series “secret sauce.” According to Reid, AllFrame works in conjunction with the ATA Streaming command set (which puts a priority on the time to transfer data over the integrity of the data) to reduce write errors and mitigate frame loss. If your cameras capture a recording of a burglar breaking into your home or office, but the hard drive hiccups on the one frame that shows the intruder’s face, the entire recording is pretty much useless. WD claims its Purple drives are only about 5 percent faster than the competition when supporting up to 16 cameras, but that its drives are significantly faster in configurations supporting up to 32 cameras. The company also said its Purple drives are 45 percent more power efficient than the competition when the drive is idle, streaming, writing, reading, and particularly when spinning up. Reid said WD will be supplying OEMs directly at first, but that the drives would be available in retail channels such as Amazon and NewEgg soon. A single 1TB drive costs $90, 2TB drives are $120, 3TB drives are $160, and 4TB drives are priced at $200.